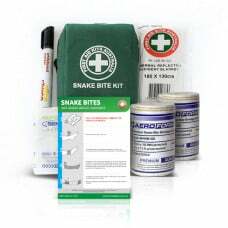 Our Premium Snake Bite Kit contains two Premium Compression Bandages with Indicators. Having a Snake Bite ﻿Kit or a First Aid Kit with cover for venomous bites is vital in Australia. A more comprehensive First Aid Kit should also be considered for other illnesses and injuries. First Aid Training is essential to saving a life. Call us to book your refresher.